It seems that while I’ve been busily painting and staining, there’s been a whole lot of nasty food contamination happening. Even if you don’t eat this stuff, please give it a scan so you can share as appropriate. Nobody wants to eat these things. First up apple chicken sausages. Sold under different brand names, so if this sounds like something you have or would buy, please check the details here. Apparently there’s a risk of eating some plastic machine parts with your chicken. Yeah, gross. Next we have products from Blue Bell Creameries. This is a Texas based dairy products brand that started as a much smaller recall and has now expanded to their entire line of dairy products because of a risk of listeria. Details here. Finally, queso fresco from La Clarita Queseria for staphylococcus aureus. More about that particular risk here. More about the recall here. Eat well, be well friends. Friends, Family and Fans….. or is it Fan ;-)? Wait, our mother doesn’t count as a Fan…. It is my honor to share with you a review and a recipe from “Crave, Eat, Heal: Plant-Based, Whole-Food Recipes to Satisfy Every Appetite” written by Annie Oliverio, AKA anunrefinedvegan. Both Little Sis and I are big fans of Annie’s delicious and healthy plant-based recipes and we have shared recipes from her blog in the past, so you may be familiar with some of her incredible recipes. What has been left out of our sharing, and what is abundant and one of the extremely appealing elements of her book is the photography. In looking through the book I was reminded of looking at a well-crafted seed catalog. You can spend a good amount of time just planning and dreaming and seeing the abundance of the natural world! Each photograph inspires you to eat better, feel better and enjoy truly delicious food. She is really an artist in the kitchen and behind the lens and you will enjoy this book visually as much as you will enjoy the content. As far as the content goes, the book is divided by cravings…., so instead of “Do you feel like Chinese or Mexican food tonight?” You can ask yourself or your eating partner(s), “Do you feel like salty, creamy, comfort food, carbs or crunchy tonight?” It is an interesting and helpful approach to changing your diet to healthier food to find foods which scratch those gustatory itches which you may previously have scratched using unhealthy or processed foods. Annie also provides a lot of help for those not familiar with plant-based or vegan cooking, so you can begin the book with an education that will help you and your family incorporate more vegetables and less animal fat into your diet. And although I didn’t mention sweets above (because it was a dinner question), there are many fabulous sweets recipes to satisfy the post-dinner sweet tooth. This is truly a gorgeous and informative book. Annie is a thoughtful and interesting writer as well, so you feel like she is talking to you and helping you along with a bit of humor and lots of lovely intentions. I prepared a recipe that satisfies carb cravings but can be GF – perfect for us because I can tell you that being GF can cause some serious carb cravings. I am going to use her photo, because if you can use Annie’s photo – you should! I am also going to use her introduction to the recipe because it will give you a taste of her engaging style. We are giving away a copy of the book to a lucky reader! So here’s the dealio on the giveaway – I won’t make you read more, because I know you want the free stuff. I get it, I like free stuff too! All you need to do to enter the giveaway is to leave a comment on this page. That’s one entry. If you’d like to double your chances, take a trip over to our FB page and give us a like. Two whole chances to win this lovely book with just a little typing and clicking. Yay! Okay – you’re all entered up, so now let’s talk about Annie’s fab food! If you’re familiar with the television show, Seinfeld, than you probably remember the episode about The Bad Breaker-Upper. Well, I’m The Bad Wrapper-Upper. I can’t roll a wrap or burrito to save my life! But it doesn’t stop me from trying. This recipe was inspired by one I saw many years ago on a blog called Herbivoress, and I was surprised at how delicious this seemingly strange combination of flavors was. My recipe is admittedly a lot more complicated than the original – but the basics are in there: potato, cauliflower, tahini – – and pickles. Preheat the oven to 425-degrees. In a large bowl, combine the potato, cauliflower, onion, garlic, vegetable broth, liquid aminos, and spices and toss to combine. Pour this mixture into a shallow baking dish and spread into one layer to speed cooking. Bake the potato-cauliflower mixture for about 45 minutes, turning the vegetables two or three times. The vegetables should be soft and slightly browned at the edges. 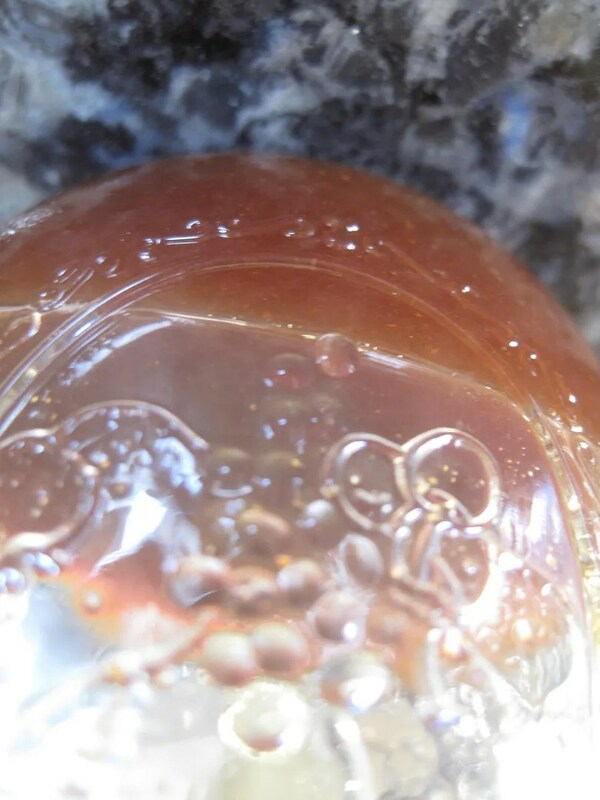 If the mixture dries out during the cooking time, add a splash or two of water or vegetable broth. While the vegetables cook, prepare the dressing. Combine all of the dressing ingredients in a high-speed or regular blender and process until very smooth. Set aside. To serve, gently warm the tortillas, lavash, or pita breads. You can either mix the vegetables with the dressing, or you can spread some of the tahini dressing on/into the breads and then add the other ingredients on top. Divide the romaine lettuce between the breads, then spoon on the potato-cauliflower mixture, sprinkle with chopped parsley and top with one pickle spear per wrap. I prefer to eat this when the potato-cauliflower mixture is warm, rather than hot. Recipe reprinted with permission from Annie Oliverio and Front Table Books. There you have it my friends. More vegetables and less animal fat is easier, tastier and oh so beautiful with Crave, Eat, Heal. Check it out! Holy Bananas I can’t believe March is over! After all that dreadful winter, the calendar leads me to believe Spring is actually upon us and the rain gauge outside agrees. Yay! I bought some pea plants today to give the garden a jump start – they were so beautiful on the shelf at the Food Co-op that I couldn’t help myself. Sometime over the next few Spring-y days I’ll get them in the ground. Because if there’s one thing I love in Spring, it’s garden fresh peas. Mostly I love eating them off the vine when nobody else is looking, but I’ve also been known to throw them in food for others, like the Company Good Pea Soup featured in this week’s menu. I’ll have to buy some for that, but even store bought fresh peas are a nice welcome for Spring. Bigg Sis and I have both had a busy month in the parts of our lives that we don’t really highlight here. She’s been working her behind off at work and school. I’ve been trying to keep the twins engaged in what has been a less than spectacular academic year and learning and performing a whole lot of music. All that activity helped to shake the winter blues away, but sheesh we’ve been busy. I can’t believe we actually managed to write some posts at the same time. Bigg Sis tempted us with Healthy Stuffed Peppers – which earned her a 100% approval rating at her house (a score that is difficult to achieve in both of our homes). 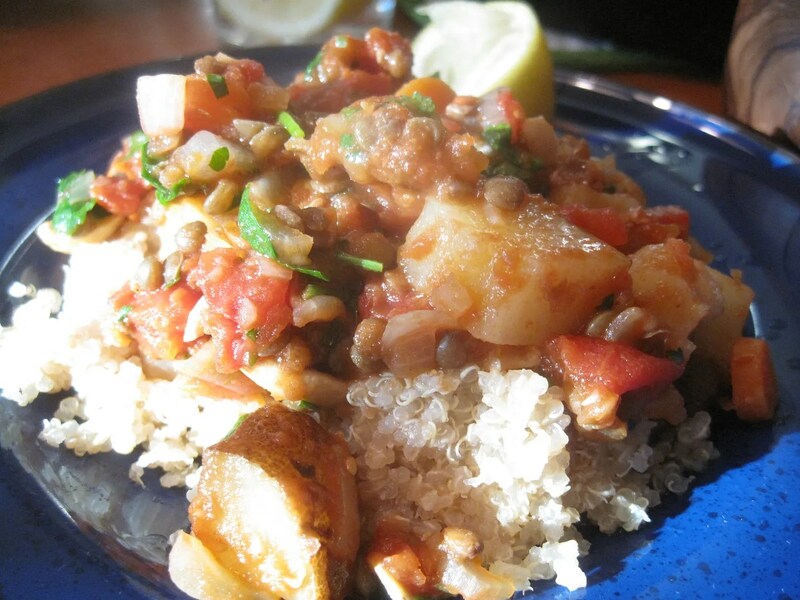 I shared a variation on one of my favorite simple one pot dishes: Lentils, Potatoes, and Tomatoes. So good, and great as leftovers (I just thawed and ate some yesterday). A fan of potatoes and want a new way to eat them? Try Bigg Sis’ Shepherd’s Pizza – we loved it! Or go more traditional, and make some dairy free gravy using a tried and true cooking technique for sauces and gravies – a roux. Oh sweet comfort food, how I love you. If you are also a fan of comfort food, try some of our meal plans from March (especially earlier in the month when it was colder) to shake things up at your house. We do these plans every week and it’s made a huge difference in my ability to plan, budget, spend less time at the store and have something on the table in a reasonable amount of time. Nice, eh? Take a look at all our Weekly Meal Plans by clicking on that category in the sidebar. Unfortunately March brought us some food warnings and recalls. 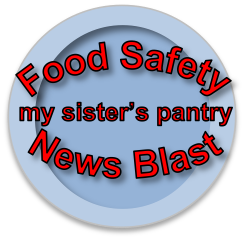 We post these when they catch our attention (find them in the Health News and Views category), but if it’s something you’re worried about, you should check out the Food Safety News website. I’ve also been contemplating posting these to our Facebook page, which you’ll find at Baby Steps to Better Health. Hope you’ve had a spectacular March friends. I don’t know about this lion/lamb business where March is concerned, I’m just glad it’s finally getting warmer. Lion or lamb, we hope things are looking brighter and sunnier in your neck of the woods. Garlic Powder: Natural Grocers recalls all organic garlic powder for potential salmonella. Walnuts: Wegman’s recalls organic walnut halves and pieces for potential salmonella. What about the boxed Mac n Cheese? Salmonella – a bacterium associated with food poisoning and other digestive woes? 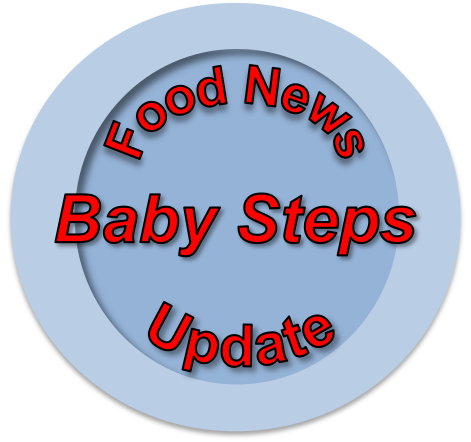 Listeria – a bacteria commonly associated with processed foods? No, friends. Certain lots of mac n cheese may contain metal pieces. Metal pieces. Like, pieces of metal. Not part of the natural world at all, dirty or clean. Do yourself a favor, replace that expensive not very nutritious box of potentially metallically infused macaroni and cheese with our Instantly Healthier Mac N Cheese. Or, if you want a dairy free version, try these Zucheesey Noodles. You don’t need that stinkin’ box. In case you missed it, St. Patrick’s Day is coming. I know this because my Facebook feed is full of preparations. I haven’t even dared to open Pinterest lately for fear of green splatter rolling off the screen and onto my sweater. It seems like people are a little extra excited about St. Patrick’s Day this year, Irish or no. I can’t say I blame them. Those of us in the perpetual snow belt this winter are ready for a little green. But is St. Patrick’s Day really that big a deal? Do I have to make sugar cookies (let’s face it, they’re a huge pain in the patootie)?! In case you don’t know, St. Patrick’s Day began as a celebration of St. Patrick, who legend holds was largely responsible for bringing Catholicism to Ireland (that’s what was meant by driving the snakes out, and that’s all I’m gonna say about THAT). Over time, as so often is the case in a world full of people who are ready to celebrate something, St. Patrick’s Day has come to be a celebration of all things Irish, of leprechauns (magic and luck), and of green food (beer). So I guess we get to the sugar cookies by way of the green food thing and if you make them in the shape of clovers you get to cover all those bases. Personally, I’m not Irish, but I can get down with some Irish music, and if celebrating St. Patrick’s Day will bring a little joy into the slowly melting landscape, I’m all for it, but I’m not making sugar cookies (yes, I am that mean and that stubborn). My daughter has already asked what we’re doing for St. Patrick’s Day. In her mind, we must have a plan for all of these holidays. So I’m thinking about a few courses of action, because honestly I could use a little celebration pick me up as well. 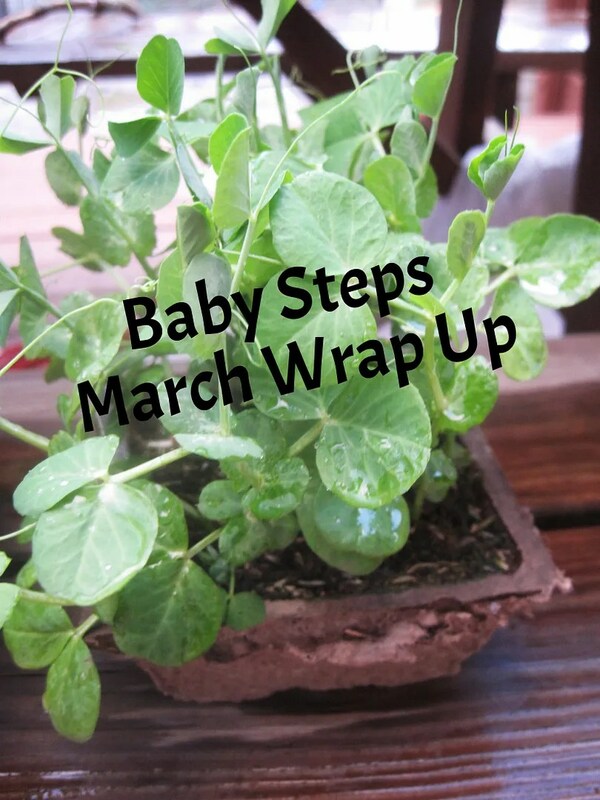 Our Baby Steps styled St. Patricks Day may include Irish cultural fun, “going green” activities, and LOTS of green food (insert evil nutritious laugh here). For the cultural part I figure we’ll listen to Irish music all day. I have some traditional stuff that I bought years ago and if we get weary of that, there’s always Pandora – pretty sure they’ll be rockin’ the Irish and Celtic playlists that day. We’ll also learn about the history of the day, because I used to teach history and I’m annoying that way. We’ll wear some green, but I also thought maybe we’d go a little greener. We’ll plant some seeds, maybe including some clover to be fun. We’ll recycle some trash into treasures (they made robots with cans, serious re-users my kids are). Perhaps we’ll pull out the fairy houses we started working on in the fall and see if we can’t incorporate our recycled treasures there. And then there’s the food… could there be a holiday that’s more of a food whack Mom’s dream than St. Patrick’s Day? Mercy no don’t make cupcakes and color them green with food coloring. Prepare food that is naturally green and maximize that holiday participation advantage. They’ll do anything to celebrate a holiday, right? You don’t need no stinking food coloring (see why here). You’ve got green food. In case you think I’m nuts, I’ll give you a list of links. This is one of those moments when it’s all the marketing, especially if you have little ones. Talk about leprechauns, talk about clover, talk about everything green and then put it in your mouth. Yum. 2. Roasted Cabbage – Green and traditional. Works for us! 3. 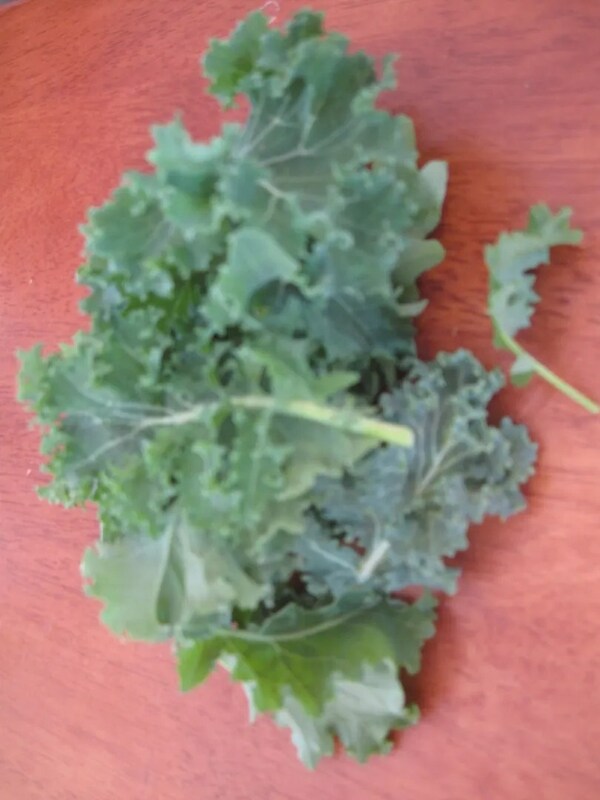 Kale Salad – Pretty amazingly green, right? 4. Broccoli and Snap Pea Varia-Bowl – so many delicious green, springy, lucky veggies. 5. 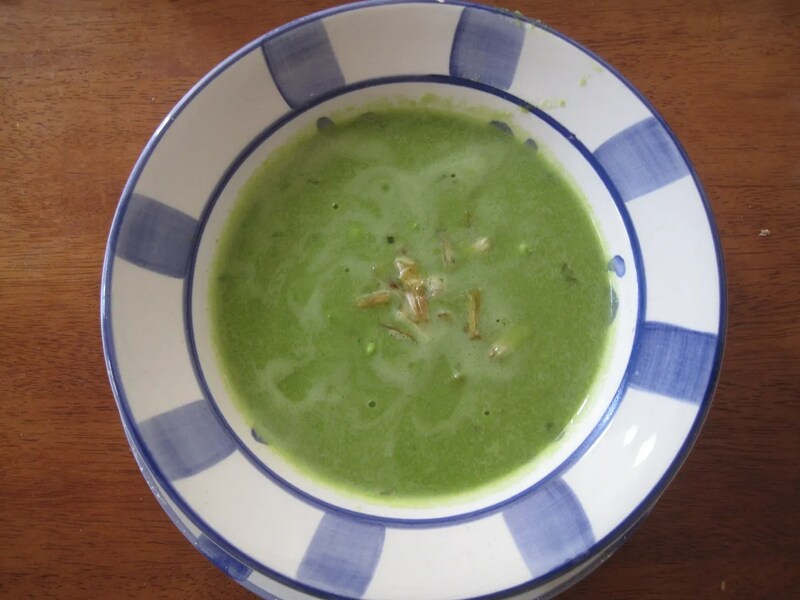 Company Good Pea Soup – So easy, so yummy, and so very very green. 7. 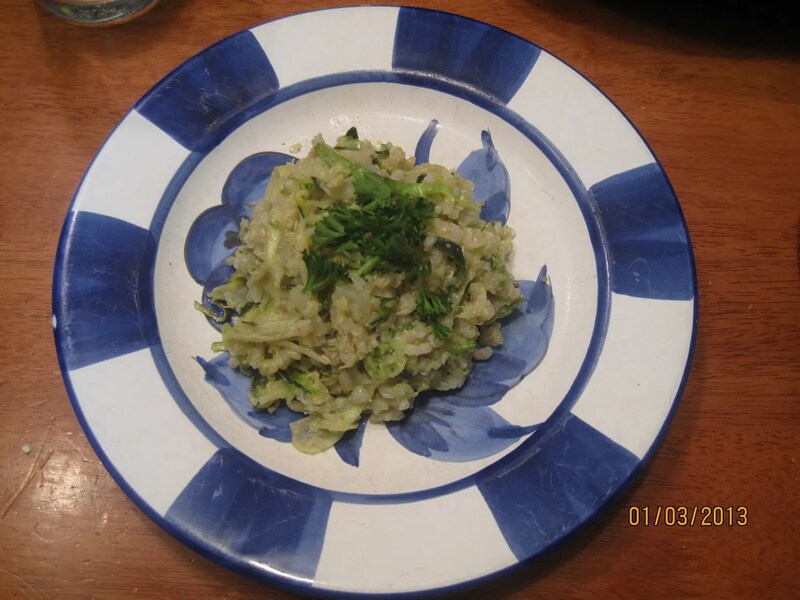 Herbed Zucchini Rice – This one’s green AND really fast. 8. Zucchini Noodles – Serve with some pesto and you’ve got a super green delish dish! 9. 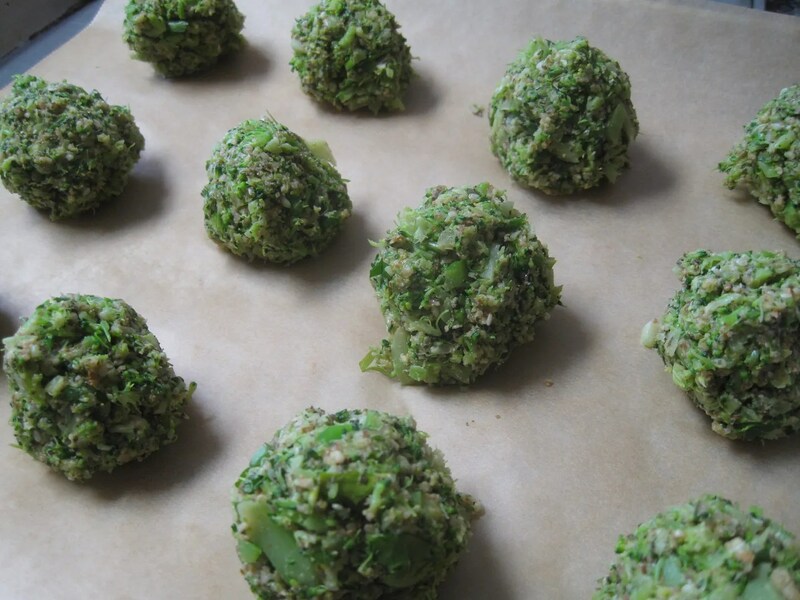 Broccoli Neatballs – These little suckers are so flexible. Eat them with everything. 11. Food Hangover Kale Smoothie – In case green beer is a part of your St. Pat’s requirements, this might work wonders for the adults. Kids love it. What a great way to end a green celebration! 12. Zucchini Oat Chocolate Chip Cookies – If you do have the baking urge, why not make these truly green cookies. We love them! There you have it folks – 12 ideas for green food to celebrate whatever part of St. Patrick’s Day rings your bells. Hope you and yours are finding plenty of nourishment and magic as the seasons begin to turn. New Dietary Guidelines – Who Knew?! As if there weren’t enough people in the world telling you what to eat – you’ve got your parents, you’ve got us… A few days ago, a panel of top nutrition experts submitted their report to the federal government, describing changes that they think would benefit the average American diet. Wait, what?! A group telling the government how they think I should eat – wait, what?! Well just hold your horses if this is the kind of thing that distresses you. These folks are no joke when it comes to nutrition recommendations. The panel includes Frank Hu, professor of nutrition and epidemiology at Harvard’s School of Public Health; Marian Neuhauser of the Fred Hutchinson Cancer Research Center in Seattle, WA; and Alice Lichtenstein, the vice chairwoman of the dietary guidelines committee and a professor of nutrition science and policy at Tufts University. This is no group of average know-it-alls. When it comes to nutrition, they may actually know-it-all, or at least know that which is already known… The panel took a look at previous nutrition guidelines, pulled them apart, took in all the most recent research and the latest medical findings and you know what they want you to do? Eat more vegetables. Yep. Eat your veggies people, and not so much of the other stuff, especially red meat, processed meat, and sugar. All that fretting about coffee? Keep your consumption in check and it might actually be good for you. All that worry about cholesterol? Again, stay out of the deep fat fryer and you’re probably just fine. But red meat, processed meat and sugar… yeah. For the first time this committee looked not at particular nutrients (i.e. Vitamin D) but looked at the benefits and detriments of whole diets. Looking across your days, weeks, and months – what are you eating the most of? They’d suggest veggies, fruits, whole grains as a big part of that answer. Legumes, nuts and seafood also feature heavily as does lower fat dairy (why lower fat if the whole cholesterol thing is not an issue, but I won’t quibble as I don’t eat it). That’s a lot of really good things to eat if you ask me. I think I could live that way. Wait, I think I do mostly live that way. And for me, and I suspect for many other people, it is the mostly that matters here. If you’re inspired to get things going, feeling like just maybe you could feel better, we’d really be happy to help (see our E-Book: Baby Steps to Better Health: Winning the Battle with Junk Food for Families and Individuals for details). We’ve thought a lot about food. Actually, we’ve thought an embarrassing amount about food. We’ve changed, and are still changing. You can too, if you want. The great thing about it is you get at least three chances every day to try to get it right. Eat well, be well friends! More about the panel and their findings here and here. I cut out a bunch of stuff I normally do. I asked people to bring food to events I usually cook for. I let my husband send me off to bed a few times. BUT with all that, I probably didn’t do enough to take care and protect myself. So this thing has dragged on and on, and anytime I thought it was getting better, a new sign of unwellness would erupt. I began to do some searches… if I don’t want to go to the doc and get antibiotics to change the color of the gunk coming out of my head and lungs (sorry, TMI), what can I do to change that color? If I’ve had so much honey for my cough that I feel like I’m going to toss, but still need an expectorant, what can I do? If I’m supposed to sing at church and my throat hurts and sounds scratchy, what can I do? If I am not up to making Christmas cookies with my kids but they really, really really want to make them, what can I do? I’ll start with the remedies and end with a super easy and marginally healthy sweet treat. Please understand that I am not a medical professional and that my N=1 study of natural remedies does not constitute science. I’m just sharing what has helped me so you can give it a go if your doctor’s office is flooded with flu patients as well. Please do seek professional medical attention if you need it. I think it’s likely that my cough became an infection. Again I say this because of the color of the junk my poor tired body was producing. In desperation, I turned to turmeric, specifically turmeric and honey… huh? I used this recipe after a friend pointed it out to me and I read why it might be a good idea. It seems turmeric can be a super great natural antibiotic. I mixed about 3 ounces of raw honey with a TABLESPOON of turmeric. Yes, you need to use that much, and yes, it will taste nasty. Sorry. I like turmeric, but wow. That’s a whole lot. The protocol is for three days: first day 1/2 t every hour (I do NOT wake myself for medicine because sleep is more important, IMO); second and third days 1/2 every 2 hours. This wiped out my whole supply and during the second day everything coming out of me turned clear and I felt like I’d made more progress in healing that I had in over a week. Nicely done turmeric. It’s wretched to cough and cough and cough. It’s even worse to do it and not have it do what your lungs need it to do. I had exhausted my tolerance for honey, and while it helped, I wondered if I couldn’t do better. A quick search showed that I could indeed get a better response without having to keep tasting so much honey. I gave this recipe for a homemade decongestant and expectorant to the test. I took the first dose and about an hour later noticed that my nose was more clear than it had been for over a week. I also noticed that I was still coughing, but not so violently and always bringing stuff up – sorry, gross I know, but necessary when it’s stuck in there. VERY impressed with this little number. This one came from my pal, a nurse and singer. Sounds like a good combo when you’re looking for throat relief, right? This one is super simple and is very similar to the master cleanse drink, if you’ve ever done that. I squeeze the juice from one whole lemon into a large mug, add about 2 t honey (more honey, oy), and a shake of cayenne pepper. Add boiling water to fill the mug or travel cup if you’re planning to go sing somewhere. This magical potion restored my singing voice very quickly. Another great one to keep in the files. Ironically the problem here is not so much that we wouldn’t have cookies. I’d already given up the idea of handing out treats to neighbors, and we just don’t go through treats very quickly. During one of the last days of school before the holidays, I donned plastic gloves and made my awesome Crancherry White Chocolate Cookies. I chose these because they are gluten free, so our first set of guests (Bigg Sis, Mr. Bigg Sis, and child of Bigg Sis) could eat them sans consequence. They are not, I discovered, my daughter’s favorite. Shocker. I discovered in talking to here, that what she wanted was to make cookies with me. She was craving the ritual and the joy of us creating a Christmas treat together. So I did some quick thinking. I needed to give her the experience without it taking a long time so I could get some more rest and/or do 1 of approximately 8,000 more chores before people started to show up. 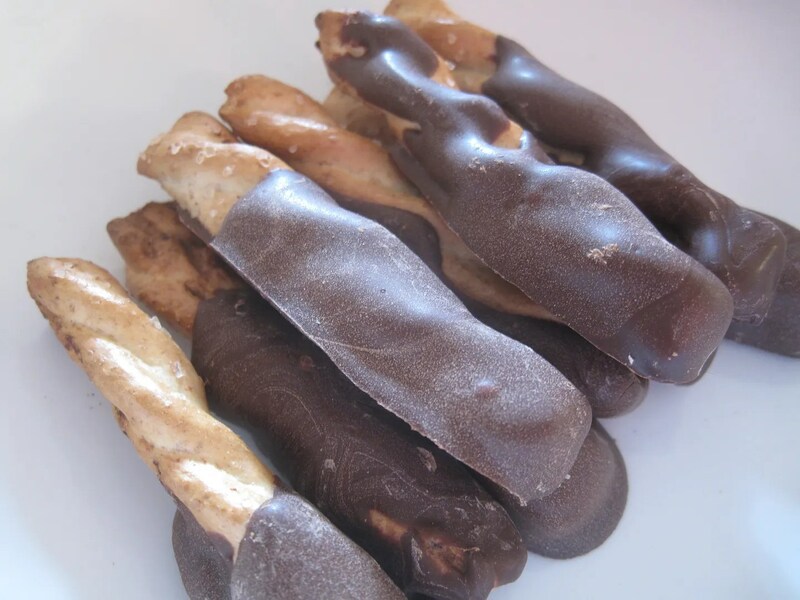 I bought whole wheat pretzel rods. I bought dark chocolate chips. Yeah, you know where I’m going. I melted the chips in the microwave (try to contain your horror, desperate times people). I set the timer for just a couple of minutes and put it at half power. You should know that sometimes the chips hold their shape even though they are melted. You should stir them after a couple of minutes to see if they are actually melted. Err on the side of less time – burnt chocolate is a tragedy. I hope your holiday has been healthy, peaceful, and soul satisfying. If you’re ill, know I’m thinking about you and urging you to take better care of yourself than I have. 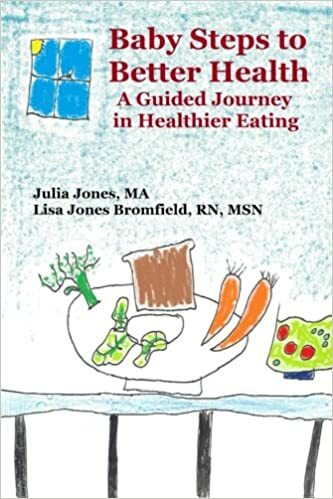 If you’re in that New Year’s Resolution making place, check out our E-Book, Baby Steps to Better Health: Winning the Battle with Junk Food for Families and Individuals, for some help with cleaning up your eating habits and filling your life with delicious real food. Eat well, be well friends. Raw almonds sold through Whole Foods markets recalled because of a higher than average level of the natural chemical hydrogen cyanide. Not clear to me from these reports how that would happen, but something worth checking into for sure. Check details on this one here and be sure to share with nut eating friends. Eat well, be well friends.